Is eating a healthy lunch a daily struggle for you? 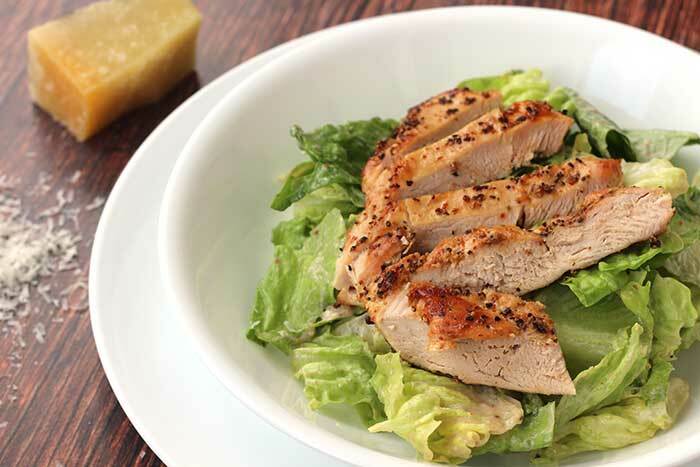 Then you’ll love this Jalapeño Caesar Salad with Blackened Chicken Breast. Today is National Healthy Lunch Day, an annual event by the American Diabetes Association to raise awareness of the need to make healthy choices at lunchtime. So many people are pressed for time these days. When I worked in a corporate environment, I often got so busy I wouldn’t even think about lunch until 2 p.m. or so. By then, I was so hungry, I’d eat whatever I saw first and it usually wasn’t healthy. May I just say … I LOVE this dressing! The chile pepper gives it some heat and you get a nice anchovy flavor from the worcestershire sauce without having to deal with the mess of anchovies. (You did know worcestershire sauce has anchovies, right?) If you have any leftover dressing, serve it over grilled asparagus. To cook the chicken, I heated a cast iron pizza pan to about 450°F. When it was hot, I brushed the pan with olive oil and added the chicken. Then I turned the oven to broil. This helped get a nice sear on the chicken. If you use firm tofu like I did the first time, your dressing will be too thick to pour! Stick with the silken tofu. A food processor worked better for me than a blender. There wasn’t enough volume for my blender to work properly. To make the dressing, drop the garlic cloves through the feed tube of a running food processor first, then add the remaining ingredients. You’ll get finely minced garlic this way with no fuss. Instead of using a whole chile pepper, I used pickled jalapeño relish. The extra kick of the vinegar worked for me. Preheat the broiler. Pound the chicken with a kitchen mallet until it's about 1/2-inch thick. Rub the chicken with 1/2 teaspoon of the oil and sprinkle with 3/4 teaspoon of the pepper. Broil the chicken breasts on a baking pan until done, about 8 minutes, turning once. Let the cooked chicken rest for at least 5 minutes, then slice into thin (1/4-inch-wide) strips. Add the jalapeño, garlic, cheese, mustard, Worcestershire sauce, tofu, and the remaining 1/4 teaspoon black pepper to a blender and pur&eacute;e. Add the remaining 1 teaspoon oil and blend until smooth. Toss the dressing with the blackened chicken strips and lettuce, and serve. (If you toss while the chicken is hot, serve immediately so the lettuce doesn't wilt.) Alternatively, serve the dressing on the side so everyone can add their own. Damn, this looks so delicious!! I’m definitely trying it myself. The blackened chicken addition just makes it even better! Hi Diego – Go for it! The dressing is phenomenal!